The University of North Carolina System president has picked a familiar face as the new chancellor of North Carolina Central University. 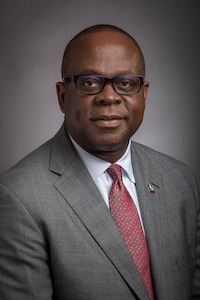 Margaret Spellings tapped Dr. Johnson Akinleye — who had been serving as interim chancellor of NCCU — to lead the public historically Black institution located in Durham, N.C.
Akinleye beat out several finalists for the job, including Dr. Brian L. Johnson, the current president of Tuskegee University who was reportedly in the running for the top post. Tuskegee did not renew Johnson’s annual contract and he is set to leave campus at the end of the month. Akinleye took over as interim chancellor last summer and succeeds Dr. Debra Saunders-White who died of cancer in 2016. George Hamilton, chairman of NCCU’s board of trustees, praised Spellings’ selection.